Do homework in the cool morning, take a nap in the afternoon… When I was a child, this is how I spent my summer vacation. Now, how do my parents spend their summers? I'll show you some pictures from parent's home. Next to my house, there's a small field. My father grows various vegetables there, like tomatoes, cucumbers, eggplants, and more. In the summer, because the dirt dries quickly, I water the plants twice a day in the morning and evening. At that time, not only do we water the vegetables, but also the garden and entrance to the house. If we do that, the slightly cooler air will come through the windows. 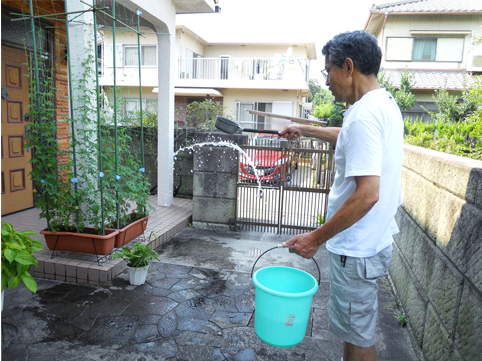 When my father does the watering, the people and vegetables who look like they will lose to the heat feel energetic. Uchimizu (Spraying water on the streets and sidewalks)… it's nostalgic. Before the roads were paved with concrete, I feel that I saw it more before. In my house, on the south and east sides, there are big windows, so it's very bright. But, in the summer, when the sunlight comes in through the window, it gets very hot, so it's difficult. 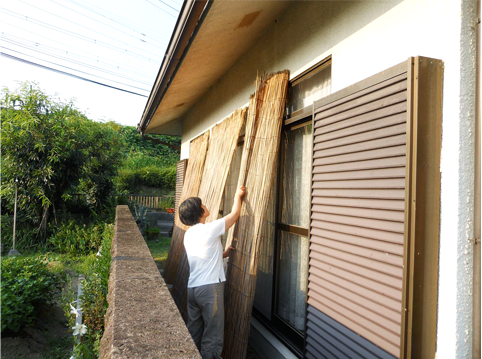 So, we place "Yoshizu" outside of the windows, in order to reduce the amount of heat that comes in from the sun. "Yoshizu" is made from plants and is better than curtains. But, a bad point is that the rooms become dark. My father and mother both like bright rooms, so in accordance to the sun's movements, in the morning, they place the "Yoshizu" on the east side of the house. In the afternoon, they roll up the "Yoshizu" on the east side, and spread the it on the south side. From my point of view, I think it seems troublesome, but they say it's better to be bright. Even in at a condo, on the west-side veranda, there are lots of yoshizu lined up! When the weather is good on a day off, my mother will put the futons outside to air on the veranda. When you air out a futon, it becomes fluffy and you can sleep well. When it's cold, air gets in the futon and you feel warmer. When it's warm, the sweat and humidity dry up and it feels fresh. But, you shouldn't air the futon too much in the summer. The latest you should bring in a futon is 13:00. If you leave it out later than this, the futon will get hot from the sunlight and won't cool off by bed time. Because of this, you won't be able to sleep because it's too hot. 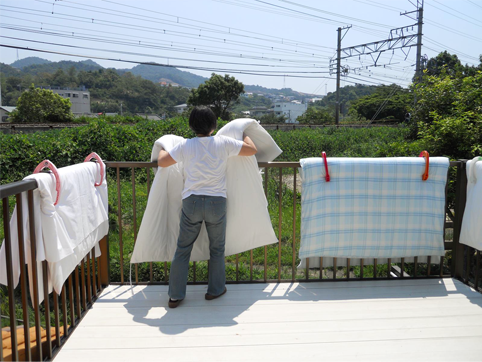 I often see my mother rush to bring in the futons when it becomes the afternoon in the summer. In winter, a warm futon feels good, but in the summer… it's a bad idea to hang them up too long, eh? When I was a child, in the summer, I would take off all the wooden and sliding paper doors. 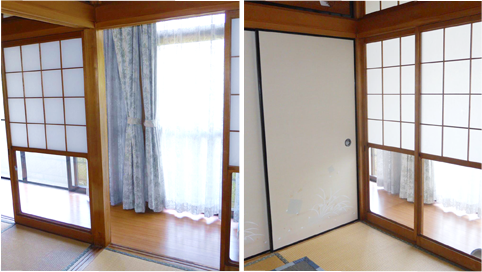 It's easy to split up a Japanese-style room into two or to make them into one room. If you connect one room to the other, the wind can flow from one window to the other. But, recently, it seems as if the Japanese summer is hotter than it used to be. It's difficult to live with the breeze from the window, so now the air conditioner is used more than before. To cool the room even just a little faster, My parents close the sliding doors and the room gets more narrow. It's the opposite of the wide rooms of the past. At my house, even in the summer, we take out the sliding paper doors. Nooooo air conditioner!